Last year I teamed up with an organization on a custom design project. We wanted to show their leaders where one of their programs for children had been effective. Like most in-house research teams, this team had a lot of data. The researchers had spent time on the ground in each country where their programming was offered. They collected data from children, parents, and program staff in both the treatment and control groups. Then, they did the math to see where the treatment group had outperformed the control group. Our 30-page report for their leadership began with a short intro about the study. Then, we launched into the fun stuff, the results! We needed to provide an overview of where the program had been effective (where the treatment group had significantly better outcomes than the control group). Here’s what the original one-page overview of the study’s results looked like. I made up fake values and hid the names of the variables, but you get the idea. There were a lot of p-values and decimal places. I’m not going to define p-values. Heck, not even scientists can easily explain p-values! Basically, lower values are better. At the very least, we need to declutter the table. We removed the outer border. We removed the vertical lines. Notice how your eyes can still read down each column without the lines. We kept the horizontal lines, but we changed the black ink to light gray ink. We need the results to stand out, and the results can’t stand out if they’re hidden by unnecessary lines. And at the very least, we need to apply color strategically. You should use your own organization’s colors so that your table (and the rest of your publication) will reinforce your brand. Throughout the report, we talked about the differences between the three countries, so we color-coded by country. In our tables, charts, and maps, Country A was always blue, Country B was always purple, and Country C was always turquoise. I’ve got another example of color-coding by category here. Here’s what our final makeover looked like. We decided to focus on the big-picture findings. So, we used empty squares to represent variables that weren’t statistically significant and filled-in squares to represent variables that were. We used p<.05 as our cutoff here; anything with .05 or lower got filled in and anything above .05 remained empty. This was the first page of our Results chapter and we wanted readers to know what happened at a glance. Apply the Squint Test to both versions. Go ahead. Squint your eyes so that you’re peering at each table through your eyelashes. The asterisks from the original version are supposed to grab our attention and help us decode the information, but they end up looking so cluttered compared to the squares. Our brains can scan a page of squares faster than they can read a list of numbers and asterisks. Data visualization for the win! And remember our audience: the organization’s internal leaders who were not researchers by training. These leaders had expertise in running organizations and launching programs around the world. They might’ve taken a couple research methods or statistics courses, but that would’ve been decades ago, and they don’t need to use those skills on a regular basis. They simply needed to know whether their treatment group had done better than their control group so that they could decide whether to expand, shrink, or adjust their approach to programming. They didn’t need the exact numbers in order to make those decisions. And I worry that providing the exact numbers can actually distract busy leaders from the big picture. The exact numbers go in the appendix of the report. The big picture findings go in the body of the report. Want to know our secret to producing the squares? We saved a million hours of time with Webdings. Yes, that crazy-looking font that you discovered back in 1999 and haven’t used since! In Webdings, a lowercase g gives you a filled-in square and a lowercase c gives you an empty square. I’ve used Webdings icons in a few dashboard projects and the results are easy to follow every time. It was important to use existing icons within Microsoft Word. This was an internal report, and we didn’t want to slow down the writing process for the research team by making someone else reformat everything in a graphic design software program. 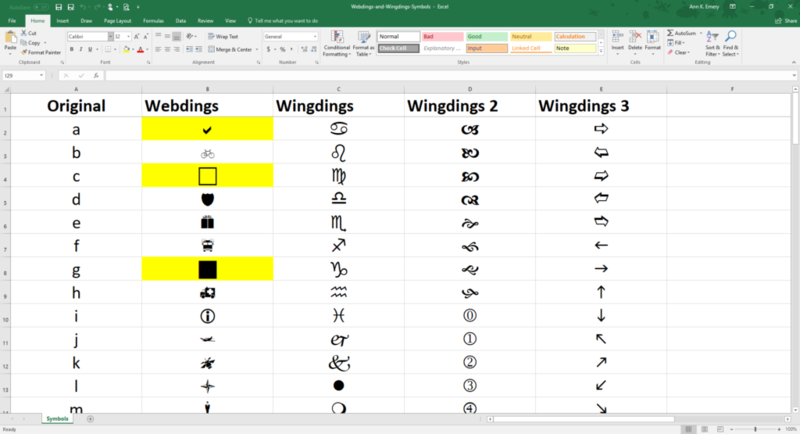 I made a list of all the shapes that are readily available to you through Webdings, Wingdings 1, Wingdings 2, and Wingdings 3 fonts. I highlighted a few of the most promising icons in yellow–but my favorite is the squares. There’s a link at the bottom of this blog post that allows you to download my spreadsheet for free. We experimented with a few drafts. Circles looked great, but they were a pain to create. We had to create individual circles using Insert –> Shape and make sure they were perfectly aligned within the table. Even making the fake version of the table for this blog post took me at least 15 minutes to get right. In comparison, creating the squares takes less than a minute because you’re just typing g’s and c’s and then changing the font to Webdings. Check marks and x’s looked too cluttered. In other words, they took longer to scan at a glance than the squares. There were too many diagonal marks all over the page. And they were so small. We could’ve enlarged the font size of the check marks and x’s to make them more legible. But then we would’ve needed to enlarge the row heights in the table, too. The real version of this table included a couple dozen variables and it filled the entire page of the report. We didn’t want to enlarge the font size, and therefore enlarge the row heights, and therefore have the table spill onto the next page. The goal was to provide the exact right amount of information to the internal leaders. There’s something psychologically stressful about tables that last for more than a full page. Finally, we experimented with thumbs up and thumbs down symbols. The non-researchers in the room loved the simplicity of this approach. But the researchers and I cringed because it gave off the wrong vibe. The thumbs down represents negativity. We didn’t want to say that something was bad just because it wasn’t statistically significant. The empty square represents an opportunity–an opportunity to do better and fill in the square. The thumbs up and thumbs down symbols were tiny, too. Can you even see them here? I can’t, and I created the symbols in font size 18! We would’ve needed to enlarge the font size… and therefore enlarge the row height…. and therefore spill the table into a second page. How are you transforming p-value tables for your non-technical audiences? Do you think any of these approaches would work for you? Leave a comment and let me know.